Age-old cedars defy weather and wind, standing proud and majestic. They offer orientation to generations of people passing by. They are weather-beaten yet strong and healthy. Even nature seems to underline the beauty of these ancient creatures with an impressive light show. They depict mystical resoluteness, strength, something everlasting. I feel drawn to these two paintings, they enthuse me. How is that? Insight and motivation nestle and develop in a human being from an early age. Sometimes you recognize the influences if you look back on your life; how you developed in a certain direction and how this was confirmed later on. As a child I read the grand stories of world literature in our library at home, while I listened to the many discussions around me about extraordinary works of art. I also had several workbooks on visual art, among others a memory scrapbook. Within that book were a few images which made a lifelong impression on me. Decades later two of these striking images were exhibited next to each other and I had the opportunity to go and see them. Early in 2016 I was in Budapest during the oeuvre exposition of the Hungarian painter Tivadar Csontváry Kosztka. For me it was an obligatory pilgrimage. These are two breathtaking trees of life. One is a solitary giant. The other, surrounded by pilgrims, seems to be even larger than the distant mountains. Weathered branches offer shadow and seem to fight the elements at the same time. For me, they stand there as metaphors for a life well lived, rooted in the source of life. The compositions are very powerful as to form and colour. Closer examination reveals splendid details. Both trees are painted with fine and rich colour transitions and contrasts, with a subtle handling of the brush. Earthly browns and heavenly blues are linked with pink light, as if it is dawn in the evening. The pinkish element in the middle suggests a transition between heaven and earth, the tree acting as the link. An eagle sitting on one of the branches and other bird associations suggest this connection as well. And all this is pictured in an all-embracing harmony of peace and motion. 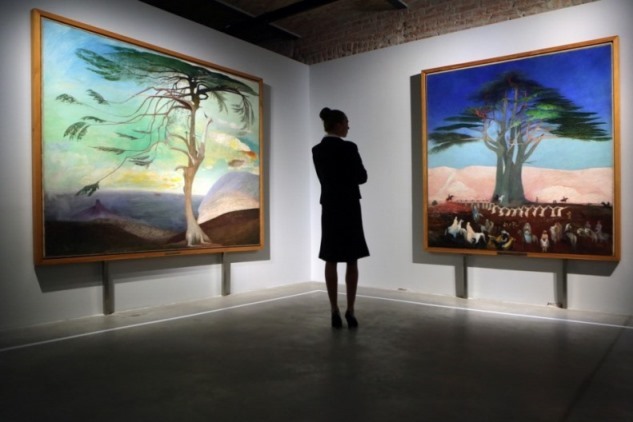 The first tree, the lonely cedar, has been discussed in art history as a self-portrait of Csontváry. 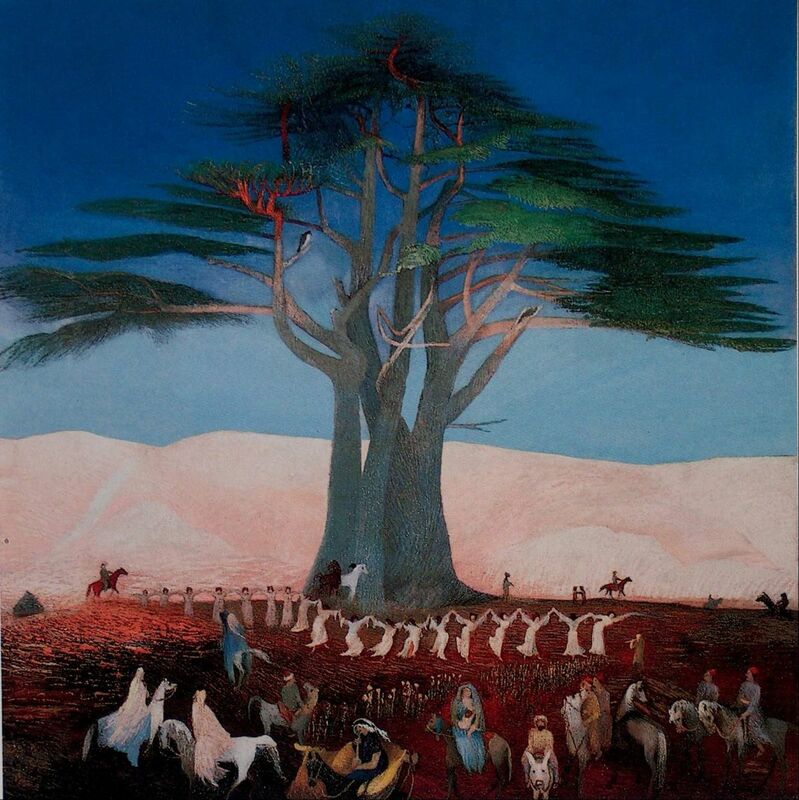 Ages seem to pass by the mythical tree of life, the other cedar standing in the midst of horsemen and dancing women in a dreamlike surreal atmosphere. As for me, the 'yarn and threads' of these paintings have become a motif in the texture of my life. Intuitively I connect to people who remind me of such cedars. And, indeed, I long to become one myself. Such witnesses to upright God! 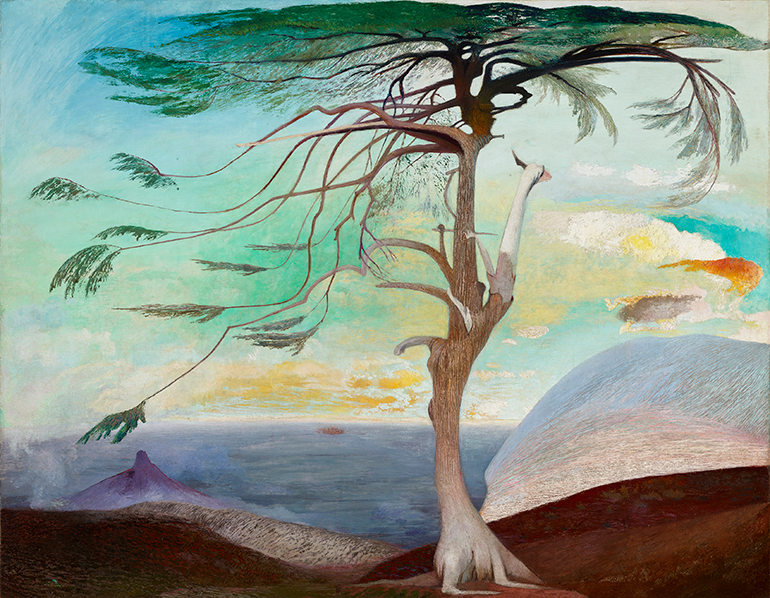 Tivadar Csontváry Kosztka: Lonely Cedar (Magányos cédrus), 1907, 194 x 248 cm, Janus Pannonius Múzeum, Pécs, Hungary. Tivadar Csontváry Kosztka: Pilgrimige to the Cedars in the Lebanon (Zarándoklás a cédrusokhoz Libanonban), 1907, 200 x 205 cm, Magyar Nemzeti Galéria, Budapest, Hungary. Tivadar Csontváry Kosztka (1853–1919) was born in the same year as Vincent van Gogh (and was also designated a lunatic). He prepared himself for his calling with great precision. By running a pharmacy, he first made sure that he had enough money to spend on his journeys in and around Europe to find his 'great motif' (as he phrased it in his own writings). He began to paint when he was about 40 years old. He studied in Germany and Paris and developed his own style based on his religious-philosophical system with traits of symbolism as well as mystic surrealistic expressionism. He characterized his style with the word ‘napút’ (sunroad), which can be understood as a synonym for en plein air, meaning that the light and air are depicted in a distinctive manner. The colours seem to 'live', to shine from the inside. His studies in chemistry certainly helped him, as he mixed his own paint resulting in an extraordinary colour scheme. About his motivation Csontváry talked among others to Leo Békessy in 1910: "The artist always helps the soul to perceive a higher, godly quality in matter, like goodness, beauty, truth, harmony. By investigating these directly, the artist ennobles his own heart." He prepared his own exhibitions with great care, yet the great breakthrough did not happen in his lifetime. His oeuvre was internationally discovered in the 1950s and 1960s. Aniko Ouweneel-Tóth is a cultural historian and art consultant. She took part in the international project ‘Converting Sacred Spaces’ which was commissioned by the Museum Catharijneconvent in Utrecht, the Netherlands. It is her passion to create incubators and platforms in which art and inspiration for life reinforce each other. In her work she focuses on contemporary art and artists. She is one of the initiators of the Platform for Church and Art. Together with Marleen Hengelaar-Rookmaaker she edited the Handboek voor kunst in de kerk (Handbook for Art in the Church, Buijten & Schipperheijn, 2015).